Sleep is such an integral part of our health and longevity, which is why we’re so passionate about bringing SenseSleep to as many people as possible. 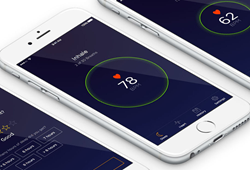 Winners for the Best Mobile App Awards (BMAs) highly competitive Winter contest were announced this week, and SenseSleep by SenseLabs took home the Silver Award for Best Mobile App User Interface. Categories included Best App for Children and Toddlers, Best Mobile App User Interface, Best Social / Lifestyle App and Best Overall App. Developed by the digital therapeutics startup SenseLabs, the science of SenseSleep is as impressive as the interface. SenseSleep is based on the understanding that the brain is built to emit relaxed brainwaves when it’s time to sleep, and guides the user through simple breathing exercises to calm the mind. “Sleep is such an integral part of our health and longevity, which is why we’re so passionate about bringing SenseSleep to as many people as possible. An intuitive design helps users experience the true benefit of the app and not get bogged down in the physiology behind it. We’re honored to have the BMAs acknowledge our efforts,” commented SenseLabs Chief Executive Officer, Chris Boone. Developers from all over the world showcased their latest and greatest mobile apps for consideration into being among the best in the industry. A team of highly regarded mobile app developers demoed and judged each app for the final award considerations. Judging criteria includes functionality, creativity, productivity, innovativeness, design, originality, and usability. SenseSleep is available now from the App Store at apple.co/1QwAPAD. For additional app details, including screenshots, scientific studies, FAQs, video testimonials and more, visit https://senselabs.com.